Fort Walton Beach's Airport accommodates passengers from across the globe. Over 50 non-stop flights daily and a staff committed to safe and easy travel make Northwest Florida Regional Airport your top choice for air travel to Okaloosa Island! The Northwest Florida Regional Airport (VPS) is the closest major airport to Okaloosa Island, FL. 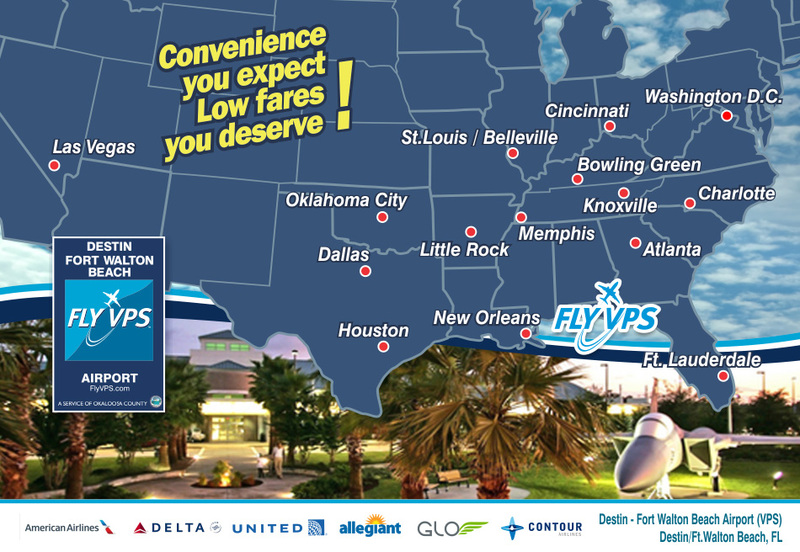 Millions of travelers each year choose VPS Airport for its close proximity to Okaloosa Island lodging, short wait times, and multiple direct flights to and from major cities. Recently expanded and constantly growing, Northwest Florida Regional Airport currently hosts the nation’s top airlines including Delta, American Airlines, and United Airlines. Located directly off FL Highway 85, VPS is easy to enter and exit by personal vehicle or shuttle, and features a short term lot, long term lot, and free cell phone parking area.